This was quite harder to decide. But while looking through I found one from when I went to Wilson Middle School in April. This is a shot that was "left on the cutting room floor" if you will. Had no intentions of publishing this photo but looking at it now I like it. I like the paint in the background. Maybe if I had a closer shot of that it would have been better. Chances are this will be the last regularly scheduled post. I enjoyed doing the picture of the week thing but there are times where it felt more like a job then a hobby. I still plan on taking pictures but I'm not going to go out of my way to make sure I do something that week. My only promise I'll make is as at least one post a month but I'll try to post more often. It also may not be about photography. Unfortunately I never got around to creating separate rss feeds for photography category so everything is still going to be lumped to together. The benefit of this is I'm no longer constrained to photos taken a certain week. I have years of photos I can pull from now. 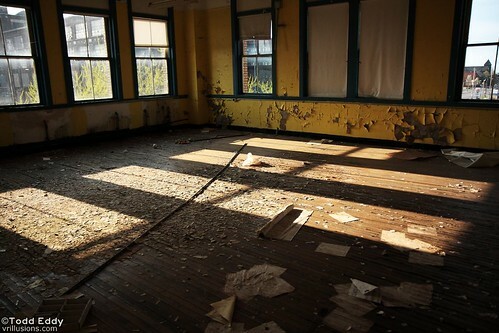 I'm going to try and do more photo shoots, and also try to do some new urban exploring. Until then be sure to keep checking back every once and a while.